Having been away from home for some time, I’ve been wanting to check-out what the fine-dining scene in KL has become. For some years, the restaurant to beat in my eyes (until it shut down in 2009 for a year of refurbishment) was Cilantro. I’ve always felt that their trademark truffle butter and gorgeous pan-fried Unagi & Foie Gras were easily Michelin star worthy. In more recent years though, word on the street is that Cilantro’s sister restaurant, Sage, has also cemented itself as a favourite amongst haute cuisine loving locals. With both open for business again, I was posed with the dilemma of having to choose between the sisters. “Why not do both?” someone suggested. Why not indeed i thought… So, let the battle begin. First up, the elder of the two sisters – Cilantro. On first looking, very little seems to have changed about the place despite the long renovations. We were greeted by the same familiar cream colours and grey suede interior… the same delicious truffle butter with freshly baked bread… and the same powerhouse of a wine list from which we chose a quite fabulous Adelaide Hills Pinot Noir. Sadly though, despite the same sky-high prices, few of the dinner dishes that night impressed as they did in the old days. 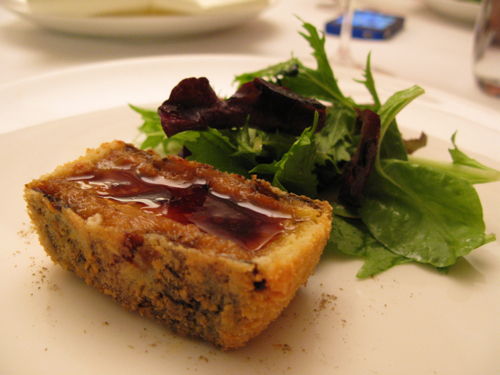 My once-favourite Unagi and Foie Gras starter was served far too hot temperature-wise. The crumbed batter tasted saturated in burning oil, almost as if it came straight out of a deep-fat-fryer. Once it finally cooled down though, I did at least manage to savour a bite or 2 of the fantastic flavours from the eel and luxuriously rich foie gras. A dish which truly defines head chef Takashi Kimura’s fusion French-Japanese style. My Char-grilled Wagyu Beef main course was a bit of a let down. I expect big things from these sacred cows that live a life of luxury and being massaged all day. Though the inside of the steak was a nice medium-rare, I found the outer layer of the meat dry and shrivelled from over-searing. Add to that a rather watery gravy, plain-jane mash and minty pungent taste from the Kinome leaf garnish and what you get is a dish I would much rather forget. I’ve had much better Wagyu elsewhere. My sister didn’t fare much better with her main either. Her monthly special of Scallops with black truffle was disappointing to say the least. The scallops though well-cooked, were under-seasoned… I suspect deliberately so as to allow the flavours of the black truffle shavings to shine. I don’t know if we overkilled too much of their delicious truffle butter at the start, but the truffle shavings themselves tasted completely flat, lacking any characteristic earthy flavour whatsoever. Not even a generous offering of extra truffle shavings from the waiting staff could save the dish. Cilantro’s desserts have never really blown me off my feet, so expectations were not all that high going into the finale. Thankfully, my rhubarb souffle (which I forgot to photograph altogether) was actually very decent. The souffle was well-risen and had a nice airy, eggy sweetness to it offset by the sharp zing from the rhubarb filling. 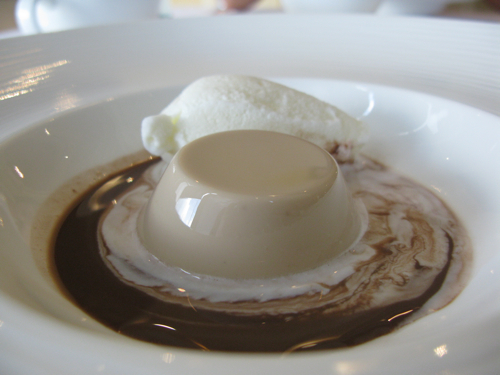 What was a bit of a disaster though was my sister’s Espresso Jelly and Blanc Manger dessert. I found the Blanc Manger and unsweetened coffee jelly completely bland. All you got after the flavours amalgamated was watered down coffee and almonds. Yee-uckk. All in all, bitterly disappointing given how much I used to love Cilantro. At over RM 300 per person for dinner including wine, disappointment doesn’t come cheap either. What of its younger sister then? Well for starters, Sage’s RM100 3-course Discovery set lunch menu, though limited in choice, offers far better value for the same Cilantro-esque French-Japanese haute cuisine. Jo was in town to visit and after two weeks of gorging ourselves with local Malaysian food, we were looking forward to a change of cuisine before flying back to London. Located on the rooftop of The Gardens @ MidValley, the setting is contemporary, spacious and clean-cut but a little sterile if you ask me. My starter of warm Fedelini pasta with Roasted Foie Gras was an interesting adventure down the French-Japanense fusion tightrope. The pasta, served in a light Asian-style spring onion duck broth was topped off with a glorious slab of foie gras. I found the flavours a little confused depending on what I put into the mouth in what order. But serve me such a generous piece of foie gras on a plain white rice and I would still happily lap all of it up. The salmon which both Jo and my mother opted for was even more impressive. 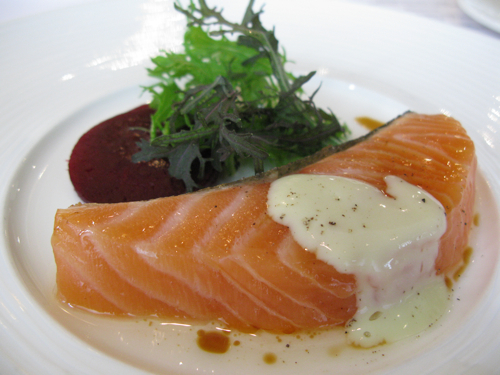 A beautiful, thick slab of subtly home-smoked fish that was perfectly balanced by the sweetness of the beetroot and spicy kick from the wasabi vinaigrette. Like a never-ending feast of sashimi, only better. Dee-licious. Both main courses were also completely on the money. 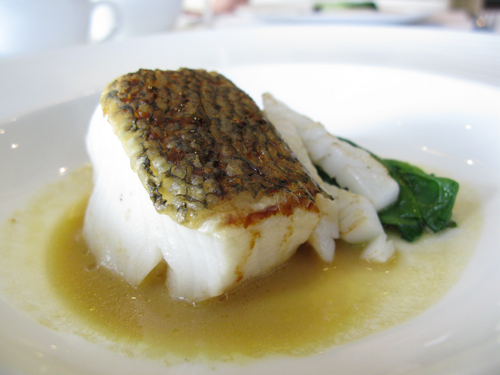 My miso-glazed Atlantic sea-bass was cooked to clinical perfection – the skin extremely crisp and the large flakes of seabass melted in the mouth like a dream. It was wonderfully complemented by the smooth sea-urchin flavoured butter which was sweet yet tasted of the sea all at the same time. I had purposely steered clear of the steak as I wanted to keep lunch light. But had I known how good the Angus Rossini was going to be, I would have ordered it in a flash. 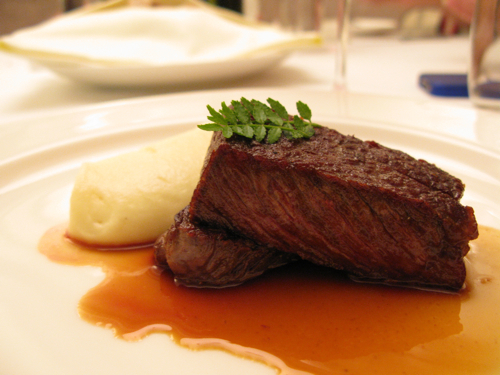 The Angus fillet steak was very tender, and like the seabass, seemed to melt away in the mouth like butter. Then came the explosion of flavours from the bold red wine sauce and the velvety truffle mash. Miles better than the Wagyu I had at Cilantro just a few days earlier. Dessert was a shrewd, deconstructed take on Earl grey tea and milk. I particularly liked the tea-flavoured bavarois jelly as it had just the right intensity of earl-greyness without being overpowering. Very nice with the milky, soft-serve style vanilla ice-cream. It wasn’t the prettiest of dishes, but it brought proceedings to a happy end. On the whole, Sage is serving up some pretty sophisticated and exquisite food. Sure, the plating and presentation isn’t mindblowing, but with the set lunch menu at a third of the price of a Cilantro dinner, its a no brainer as to which I will pay homage to when I’m ever back in KL again. Haute cuisine in Malaysia still has a some way to go to before it can compete with the Michelin-starred big boys of abroad. But at least where old favourites have faded out, new stars have emerged to take their place. Remember going to Cilantro before they closed for renovations and I think your assessment here pretty sums up my experience – good starters, so-so mains, forgetable desserts. And to think this is Malaysia’s best fine dining restaurant and ranked no. 8 in the Asian Miele guide (mind you that list is as well constructed as a condom with holes). For what its worth, my best meal fine dining experience in Malaysia was probably at Lafite (Shangri-la) back in 2003 before their head chef moved to Hong Kong to run Petrus. 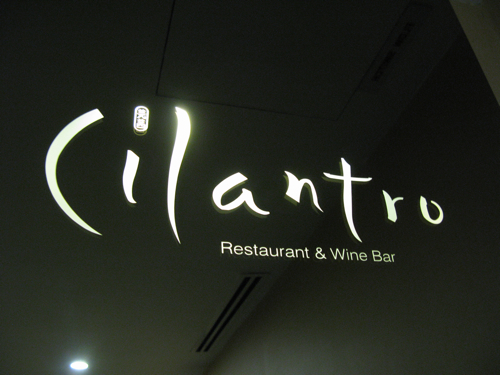 Kian: I actually used to really like Cilantro (pre-renovations that is) so its a bit of a shame they seem to have lost their way a little (at least on the recent night we visited). Been years since I’ve been to Lafite myself – last time i was there must have been round when you visited (2003 or 2004 from memory). Found the portions frustratingly small though food was very decent. Tx for stopping by! The problem with Cilantro is that you have been exposed to better ingredients overseas! If you look at the cost of a meal there, you can actually work through costing that the ingredients they use aren’t top notch. For example, grade A foie gras costs £35 to buy for an entire lobe. You get 5 slices off it once they remove veins, with scraps to use for pates etc. Now don’t forget importing costs and you are looking at perhaps RM 45 per slice. In general, food costing is about 30% of the price on the menu. Btw, just looking at the foie gras at both Sage and Cilantro, you can easily tell its not grade A foie. 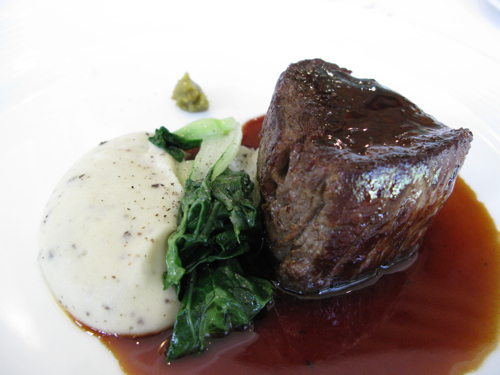 As for Lafite, yes the portions were very small but at least it was a very accomplished meal (perhaps 6/10 on my scale). It was a VERY pricey meal admittedly but it did contain plenty of premium ingredients (foie gras, lobster, truffle). What do you think of ‘3rd Floor’ at JW Marriott? p/s whats your favourite restaurant in London? Haven’t been the 3rd Floor – any good? – not even sure what kind of food it serves up, but will check it out next time I’m back in KL. 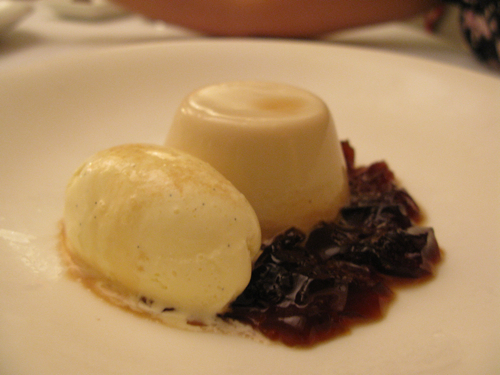 Best restaurant(s) in London for me: Viajante for contemporary. Toss up between Chez Bruce and Wild Honey for classics. Well to inform you that there is another kid on the block when it comes to Fine Dinning now in KL City. Tanzini Upper Deck, which is controlled by a young Chef called Eugene Lee. The dishes I have had in Cilantro lately have been sloppy and old. The new kid on the block is offering so much more. As the menu changes, which I am not sure how often, it brings the finest ingredients and combinations that blow me away. I have only eaten 3 times on the upper deck of G-Tower, but each time I have experienced a flavour match that is not approached by looking at the menu. But on arrival it is something special. I recommend you give the old guys a rest, and give this new Chef the stage to perform on, you will not be disappointed in my mind. Chester: Thanks for the tip. Will be back in KL soon and hope to give Tanzini a try! Book and eat at the upper deck, 29 floor. That is where the magic happens, or it did for me.